"Auckland Art and Craft Show"
It was all I wished it could be. I made some great sales, I met some wonderful people. all the other wonderful crafters. Which is a bit like Craft Hell being so close but not getting to experience it. I have spent the past few days confirming up and coming markets. I have some exciting markets coming up. for where I will be in the future. I still have more dates to load so do check it regularly. I have just finished an order. A lovely lady asked if I could frame one of my Hydrangea's. I think it turned out quiet well. people to make at these work shops. There will be a mystery prize for one of the people that gives me feedback. I will get Master O to draw a name out of a hat next Wednesday. Handmade felt tree decorations? These look so much more lovely than the shop bought bling. 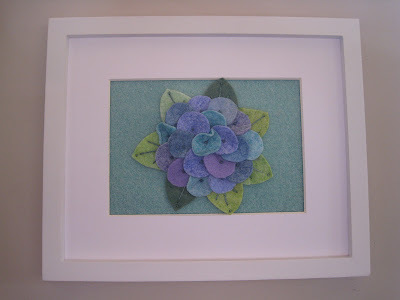 Your Hydrangea pic looks great........will you make some more? I'm sure they would sell well. As for Christmas decorations at your workshop, perhaps something decorative for the table......placemats, serviettes! !